What is happening ? Saturn on the Steering wheel and Mars about to join its Debilitation sign on the 11th July and Rahu in Leo about to Join the junction point and then join Cancer and Sun ingress in Cancer sign could unfold some Aggression by the Giants and Specially China . The Planetary positions are taking explosive turn . It is said that when the Capricorn Darkest Sign of the Zodiac is Afflicted then war like conditions prevail, specially when the Malefics Transit this sign . Unfortunately Ketu will transit Capricorn and Rahu in Cancer on the 9th Sept. 2017. Saturn , Rahu Positions will be most Damaging since connected to the Watery and Fiery signs and then Mars also joining Leo on the 26th August at junction points can work as ammunition dump. I am afraid to write Ketu in Capricorn and aspects By fallen Saturn at very close degrees after 9th Sept. 2017 could Explode the situations , Since Rahu and Ketu both have been aspected by Saturn . Saturn aspects Ketu in Aquarius when Saturn ingresses in Sagitarius on the 26th Jan. 2017 , then on the 21st June as a Fallen Planet Saturn started to aspect Rahu, now Saturn as a Fallen Planet will aspect Ketu after 9th Sept. 2017. Ever since Saturn has fallen he has Punished and Rewarded so many and brought about changes in the alignment of the Countries . Take the Example of Qatar isolated by 6 Countries. The Brawl between Trump and Kim taking ugly turn and now China also wants to join. The Situations are sickening and can take the most ugly turn. Mars Activating the Eclipse point on the 2nd Sept. 2017 of the Total Solar Eclipse of the 22nd August 2017 Could further act as a catalyst to take the situations to land in oblivion. Let me write this Article for the catastrophic Planetary positions for Heavy Rains, Tsunamis ,Earthquakes ,Natural and Unnatural Calamities , War on Sea giving weightage to “CHINA IN WAR MOOD” . India has pushed in more troops in a “non-combative mode” to strengthen its position in an area near Sikkim, where its soldiers have been locked in a standoff with Chinese troops for almost a month now in what has been the longest such impasse between the two armies since 1962. India brought in more troops after the destruction of two of its bunkers and “aggressive tactics” adopted by the Chinese People’s Liberation Army (PLA), sources said. In a “non- combative mode”, the nozzle of a gun is placed downwards. 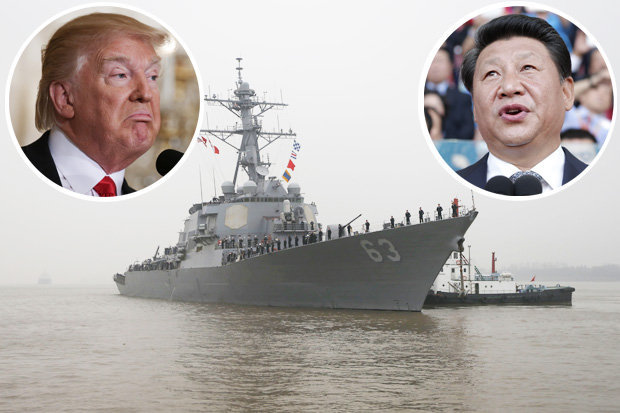 Read this News also ” STAND DOWN: China launches WARSHIPS to intercept US destroyer ” link http://www.dailystar.co.uk/news/world-news/626786/China-US-War-South-Sea-Navy-Donald-Trump-USS-Stethem-Triton-Xi-Jingping-Islands-World-3. The Situations are becoming grim day by day. For Research and Analysis let us have a Look at the Planetary positions when there was a war with China on the 20th Oct. 1962. Rahu-Ketu in Transit over the Natal Navamsha in 1/7 axis , meaning Rahu over Ketu and Ketu over Rahu. As per the above Planetary combinations the Following Dates are Prone for Aggressive actions by China in the Present Scenario along with Natural and in natural Calamities in the Country , Tsunami like events, Earthquakes , Fires etc. The Natural and In natural Calamities, Fire, Tsunami, Explosions, Earthquakes cannot be ruled out in the Globe and this Transit may not be good for the World in Totality . China will be in war mood and the Giants , US, Russia, China may be responsible for War type Escalation of Activities . I have already mentioned in my articles that from 30th April to 5th May 2019 are most Provocative Period then the Present Scenario hence if the Tensions begin now from these planetary positions they will explode in May 2019. Needless to mention the Countries Prone to Natural and In natural calamites since already articles have been written , This Transit will be applicable to all those articles as well, May be it is For India-China, US-Russia, US-North Korea, US-China. Gulf Countries , Syria , Qatar will be the worst affected . The alignment between the different Countries will be disturbed . The effects on Trump and N Modi in particular may be seen since Saturn Fallen is Transits over their Natal Moon in Scorpio and also Influences the Lagna and the 10th House in both cases.